Mr & Mrs Turtle (Adult) Surprise Underside by LoadMaster1 is licensed under the Creative Commons - Attribution license. Back in the mid 1960's there were gift ceramic turtles (see attached photos) that you could purchase much like the ones in this Things offering. They are cute little turtles and from where they set look normal in every way. However, curiosity of us humans will cause us to want to touch and explore. Most people will pick them up for a better look. We humans will naturally turn the turtles over. This is where the surprise is! These are not just any turtle, but Mr and Mrs Turtle with their gender related parts. It is fun to have these somewhere your guest will see them. Watch as they finally turn them over and the expression on their face. 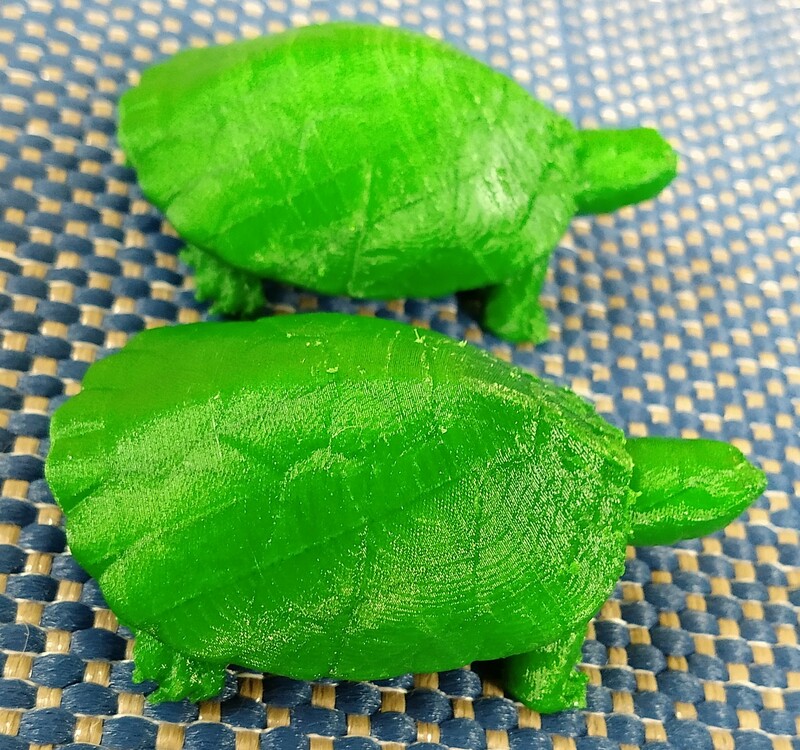 We have had so much fun with the ceramic version of these over the years, so, I wanted a 3D printer version of this fun set of Mr & Mrs Turtle. 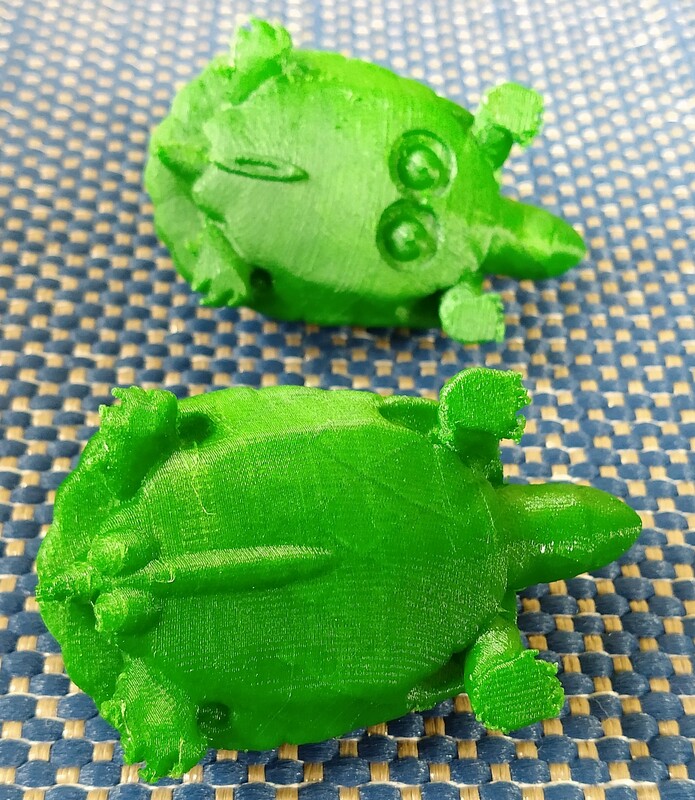 These cute turtles can be tricky to print. You may have a better idea on how to print these. For me, I found printing them with there back down and on about a 45° angle they print pretty well. I used PETG filament mainly because this was the only green color filament I had at this time. I'm sure a good quality PLA would work fantastic. Gag gift from the 60's. Cute fun little turtles have a secret. They forgot their bottom shell half showing more than they should. Mr Turtle's Bottom side with some added gear. It's just a joke... It's not real.. Cute Mr & Mrs Turtle. 10% infill, MakerGeeks Cristal Green PETG Filament. Say thanks by giving LoadMaster1 a tip and help them continue to share amazing Things with the Thingiverse community. We're sure LoadMaster1 would love a Tip, but unfortunately they have not setup their accounts to receive them yet.